BIGLER – Nearly 25 percent of children under five years old in Clearfield and Centre counties live poverty. Many of these children don’t have a single book in their home, even though The Children Education Institute statistics show reading and writing skills begin to develop in the first three years of life. The experience children have with books, paper, crayons and the adults in their life are all building blocks for future language, reading and writing development. Despite, statistics families can’t always afford to purchase books for their children or may not know how they can help their children learn to read or write. Often it takes a village to have an impact on children. Communities and a village have come together in Centre and Clearfield counties to help these children get access to the resources they need. Project PLACE (Promoting Literacy through Adult/Child Education) began as a pilot program to promote literacy among children from 3 to 5 years old so they can be successful in school. Cen-Clear’s home visitors work directly with parents and children in their home. The success of the program has led it to becoming a permanent part of Cen-Clear’s early childhood program. Cen-Clear can’t do it alone and finding funding for a program like this can be a challenge. State and federal funding often have clearly defined requirements and ongoing funding is needed as new children enter the program and materials must be purchased. Area business, charities and foundations also want to see children in local communities thrive and have provided grants to keep this program in place. 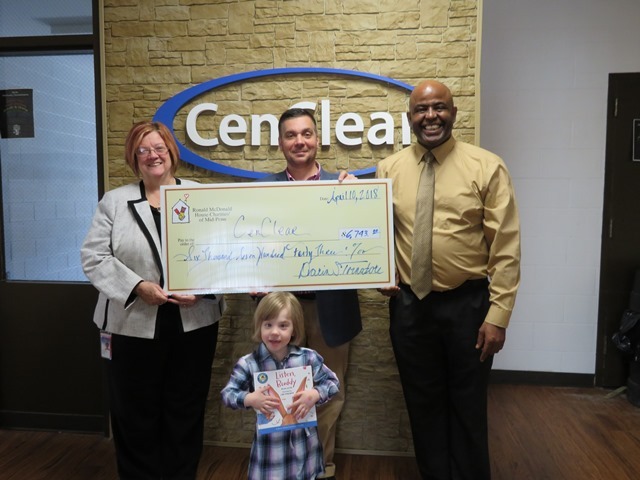 Cen-Clear recently received a grant from the Ronald McDonald House Charities of Mid-Penn Inc. and the Clearfield Charitable Foundation for this program. Grant money has also been received from the National Home Library Foundation, the American Association of University Women/State College Chapter and Kids Need to Read. The Community Innovation Zone partners, the Clearfield Area Elementary School, the Joseph & Elizabeth Shaw Public Library and the Central Intermediate Unit No. 10 also help to make the Project PLACE program a reality. The funding allows Cen-Clear’s home visitors to work to promote literacy with the Head Start families they serve. Each home visit includes the use of a specially designed literacy kit. The kit includes a folder full of games, poems, songs and projects the child and parent can do together that encourage early literacy. Each child also receives a book to keep four times a year. The goal of Project PLACE is to increase the amount of time the parents spend reading to the children and help them to understand the importance of reading to their children. Sometimes parents also struggle with literacy. Cen-Clear works with the Central Intermediate Unit Adult Education Program to determine the literacy level of the parent(s) and refers the parent to literacy training if needed. According to Cen-Clear, the impact of the Project PLACE program isn’t just on children, but on all members of the family. This is a powerful effect since parents are the child’s first teacher and the most powerful influence on their future academic success. Cen-Clear believes encouraging families to read together is one of the most important things to prepare children for success in school. More than 613 Head Start children have participated in this program in Clearfield and Centre counties. Cen-Clear is headquartered in Bigler. Cen-Clear provides early childhood, preschool, mental health and drug and alcohol services throughout a 15-county area. Services vary by county. If you are interested in learning more about the Project PLACE program, call Cen-Clear at 1-800-525-5437.